Here’s what happened in Saturday’s session of Hoard of the Dragon Queen as the party continued to explore Castle Naerytar. Each PC gets 383 xp. The PCs push open the door to the Great Hall where they are reunited with Gwastdyn and Jamna. The pair had arrived earlier that morning and by posing as cultist reinforcements had gained admittance to the castle through the front door. Sivash, the dragonwing in charge of processing the loot, sends the party to clean out their living quarters in the southwest tower. When they arrive in the tower, they realise cleaning involves killing the giant centipedes who have taken up residence. Fortunately Turin’s shatter spell makes short work of them and Gwastdyn is able to cure the nasty disease Crake contracted from the otyugh. The adventurers explore the upper levels of the tower which serve as sleeping quarters for the cultists. Heading briefly downstairs to the entry caverns beneath the tower, they return to the Great Hall where they help the cultists sort and record treasure or make new crates to transport it in. Ug refuses to help with the work so Rosie persuades Sivash that it’s for the best if he goes to their quarters to repair the cracks in the tower walls. After a while, Dralmorrer Borngray appears with his lizardfolk guard in tow, looking for the missing guard drakes. Luckily he believes Rosie when she says she heard their distinctive growling coming from inside the cesspit. When Tharm Tharmzid, the Cult’s dwarf chef, appears to serve lunch, Turin flavours the stew with prestidigitation, impressing the cook. The PCs spend the rest of the day working, then go downstairs into the caves below the castle in the evening. From the entry cavern, they head in the direction of the tracks, passing through a crane and a misty cavern. Turin casts invisibility and scouts ahead to the Frog Shrine where Pharblex Spattergoo is conducting a weird, incomprehensible ritual. The PCs attack with surprise, killing Spattergoo and his bullywug guards, helped by the pack of fey wolves Gwastdyn summons to fight for him. Afterwards the party explore Pharblex’s sanctum. Rosie casts mage hand to move the bullywug's chest, triggering a trap. Pots fall from ceiling, spreading hallucinogenic frog poison. 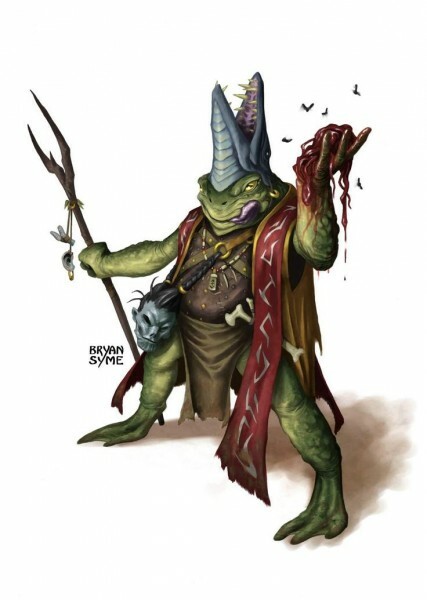 The warlock is affected, seeing rest of party as nightmarish frog-like monstrosities. She flees, escaping into a large cave filled with an underground lake. Turin casts sleep as Rosie dives into the water. Ug drags her out but she attacks the rest of the party until Crake knocks the half-elf unconscious. Meanwhile, giant frogs leap forward to attack the party. Fortunately the wolves are able to cover the PCs’ retreat and defeat the slimy amphibians. After another short rest, the PCs continue their exploration of the caverns. When they enter an empty chamber, thousands of centipedes swarm forth from the walls….